Sometimes when you travel you want to explore, see and experience as many things as possible. And sometimes, you just want to stay in one place, relax and not think about anything. If I am in the mood to relax, I’m not embarrassed to say that I love to go to an all-inclusive resort. I love the fact that I don’t need to worry about overspending on food, drinks and activities; I don’t need to think about where I am going for lunch or dinner; and I don’t even need to leave the resort to get a great meal. That is exactly why we chose to stay at Hyatt Ziva Puerto Vallarta. This resort is perfect for a family or couples getaway. There’s so much to do at the resort that you will never be bored. Kids are entertained all day long with the many activities that the entertainment team provides. Hyatt Hotels has a few all-inclusive properties in Mexico. Hyatt Ziva properties are family-friendly resorts while Hyatt Zilara is an all-inclusive adults only brand. Here’s how many points you will need to stay at one of Hyatt’s all-inclusive properties. The rates are for two people per room. Additional guests are 10,000 points/person and kids under two stay free. We’ve recently returned from a seven night stay at Hyatt Ziva Puerto Vallarta, a beautiful property situated on a picture-perfect Bay of Baderas. We booked the resort with 20,000 World of Hyatt points/night; at that time of year, rooms cost between $350-$500/night. I’ll start with what’s most important to me – the beach. Hyatt Ziva Puerto Vallarta is situated on a beautiful white sand cove in the Bay of Banderas. The beach isn’t huge but there are plenty of beach chairs and umbrellas. However, if you want to be in the first row and have shade, you’ll have to get up early and claim your palapa. I love to swim in the ocean, but on this trip, unfortunately, I wasn’t able to swim at all. Most of the time, the surf was too rough for me and the water too cold. There were a few brave souls who didn’t mind the tall waves close to the shore and still swam in the ocean, but I stayed away. We were there at the beginning of January, so maybe the water is better for swimming during warmer months. The natural beauty of the beach, the Bay of Banderas and the surrounding area is absolutely stunning. I couldn’t stop taking pictures of the ocean, the mountains and the sunsets. Sunsets deserve their own mention, I’ve never seen such beautiful sunsets – it’s like mother nature’s light show. There are several pools, all situated along the beach with great views of the ocean and the bay. There’s of course the requisite swim up bar at one of the pools. All the pools are fairly small, especially the adults-only pool. Depending on how full the resort is, they can get very crowded. The weather during the first week of January was very nice. The first two nights were really cool, we had to wear long sleeves and a sweater, but the last two nights were very warm and balmy. The mornings are pleasantly cool and it was nice and hot during the day, perfect temperature to lounge by the pool or on the beach. In short, the food was truly outstanding. I can confidently say we didn’t have a bad meal there. There are four al a carte restaurants and one buffet. All restaurants serve different types of cuisine. There are also food carts, a 24-hour coffee shop that serves delicious coffee and pastries all day long, and five bars. The 24 Hour Coffee Shop at Hyatt Ziva Puerto Vallarta. The resort also does Mexico night once a week with huge Mexican buffet and entertainment by the main pool. Mexican Night at Hyatt Ziva Puerto Vallarta. What really sets Hyatt Ziva Puerto Vallarta apart, and what sets all Hyatt all-inclusive properties apart, is the fact that you don’t need to make dinner reservations at the sit-down restaurants. There’s also no dress code for men; they don’t have to wear long pants and collared shirts, like at other all-inclusive resorts we’ve been to. We’ve sampled all restaurants and all of them had great service and amazing food. One of the restaurants, Blaze, is even open for breakfast and serves Mexican breakfast dishes. The buffet isn’t huge but has great variety and very tasty food. Most importantly, they have the best freshly-made guacamole! Unlike other resorts I’ve been to, there’s always something open, the restaurants stagger their opening and closing times. No one will go hungry at Hyatt Ziva Puerto Vallarta! Hosts and servers at all restaurants went out of their way to ask about food allergies. I eat a gluten-free and dairy-free diet, so I really appreciated everyone’s willingness to accommodate me and be proactive. There’s also a 24-hour room service, but we didn’t try it. This is where there’s a lot of room for improvement. The resort has two buildings – the Club Tower and the Main Tower. Only Main Tower rooms are bookable with points. My husband is an Explorist and at arrival, the front desk informed us that we were upgraded to a partial ocean view room. What I didn’t realize when I booked our stay, is that not all rooms have balconies. Every other warm weather resort I’ve been to had a balcony, so I didn’t even give it a second thought. Our room did not have a balcony. We asked about being moved to a different room, but were told none were available. Unfortunately, that was’t the only issue with our room. The rooms in the Main Tower are nice, but nothing special. When we turned on the AC we quickly realized how loud it was – there was a loud rattling noise. The hotel’s maintenance checked it and told us that this was normal. Surprising, considering how expensive the resort is and the fact that it’s a Hyatt. The rooms have single pane windows that don’t do much to muffle the noise from the outside. This might not bother everyone, but the sound of the pounding surf at night is very loud. It definitely wasn’t the gentle lapping of the waves on the sand, it was full on pounding of the Pacific Ocean. The bathroom was a good size, with nice toiletries, but there was very low water pressure. The water temperature wouldn’t stay consistent. When taking a shower, you were accosted by cold water or scolded by very hot water. Complaining to the front desk and front desk manager did nothing. We were continuously told that no better rooms are available, even though, every room category was available for booking on the website. After I saw that we weren’t getting anywhere with the front desk team, I took to Twitter. I posted a public tweet and sent a private message to Hyatt outlining all the issues with our AC and the hot/cold shower. I received an immediate response from Hyatt Concierge promising to pass the information on to the resort’s senior management. Next morning we tried to change rooms again and finally got a front desk manager who was able to help. I don’t know if he was one of the people that Hyatt Concierge contacted, or he just wanted to help us, but he moved us to a room in the Club Tower. And what a difference! Club Tower rooms have nice quite AC, amazing showers with consistent water pressure and temperature, and double pane windows. We spent the last four nights there and felt like we were finally experiencing Hyatt luxury. I wish there was a way to book Club Tower rooms with points. I could tell right away that the rooms were recently renovated and there was a big balcony (finally!). The rooms and the lobby are decorated in mid-century modern style with lots of natural wood and beautiful Mexican accents. There’s a bar downstairs and a small snack area with fruit, pastries and small bites. The resort offers two free tours, a kayak tour and a jungle tour. Both leave at 9 a.m. from the activities desk, and are available depending on the weather. There is a water exercise class every day at noon, which was a lot of fun, and the entertainment crew organizes beach volleyball, kids activities, bingo and other games. There’s also a kids club at the resort. I booked a day trip to two nearby towns of Sayulita and San Pancho through the tours desk in the lobby. The price of the tour was about $50. I loved the day trip of these two very picturesque and idiosyncratic surfing towns. The drive through the coast and the rain forest was beautiful and I felt like I got to see some real Mexico. There were only 10 people on the trip and I had lots of opportunities to talk to the tour guide. I highly recommend this tour. Because I booked the Sayulita tour, I got a free tour of Puerto Vallarta, which was basically a shopping tour. I am glad I went, because otherwise I would have had to take a taxi to get into town. Not a big deal if you want to go on your own, the drive is about 10 minutes long and costs about $7. Puerto Vallarta is a picturesque little town with lots of shops, bars and restaurants. There’s not much nightlife at the resort, so if you want entertainment, just take a cab to Puerto Vallarta. I booked our flights with United MileagePlus miles. I spent 17,500 United miles for economy one-way and we paid about $70 per person in taxes. I’ve earned the miles by opening Chase United Explorer Business card which now has an increased signup bonus of 75,000 United miles. I transferred Chase Ultimate Rewards points that I earned with Chase Business Ink Preferred card to my husband’s World of Hyatt account because he has the Explorist status. Our only other expenses were taxi fares, tips and the excursion. This was my first time traveling to Mexico’s west coast and certainly not the last. The beautiful scenery and delicious food are definitely a big draw. In spite of some issues with our first room, this was a great vacation. We had great time in Mexico and I am still dreaming about all that delicious food! I realize that the room standards might not be the same in the Caribbean or Mexico as they are in the U.S. However, all I want is for my room to have a quiet and efficient air-conditioning unit and a shower with consistent temperatures. I think expecting these two things is not unreasonable at an upscale resort. Point Me contributor Stephen reviewed this same property last year from the perspective of a young traveling couple. 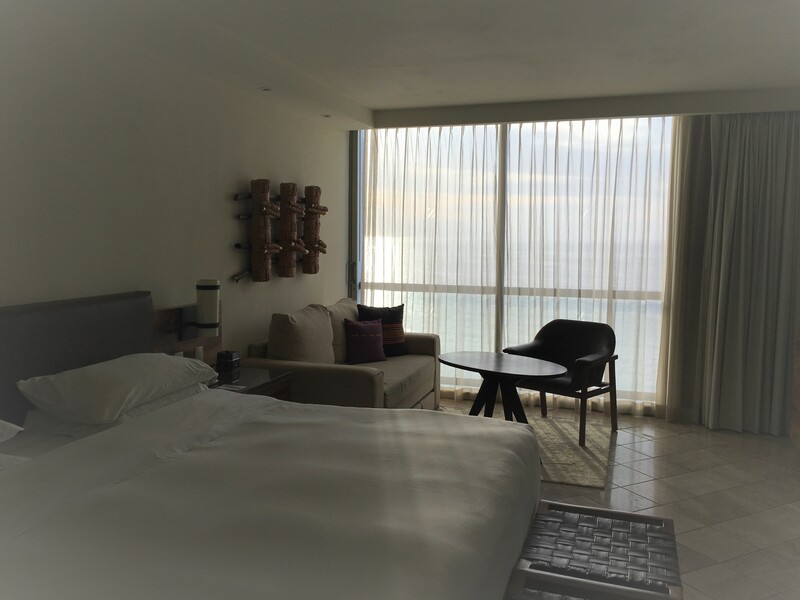 Check out his take on the Hyatt Ziva Puerto Vallarta here. HI Glad you enjoyed your trip. BEWARE the Hyatt Ziva CABO! FAKE LIQUOR at the bar. Most all the bottles at the bar had totally fake mexican boot leg liquor filled into the real bottles. You name it, all were filled with fake. The resort management was totally in on the con job. I called Hyatt corporate to investigate, totally blew it off, as they know what they know what is going on and afraid to confront the resort and the brand. Offered me some consolation point. Fake and watered down liquor is totally BS at the ZIVA mexican resorts. Don’t believe, just search the internet and read the stories. It’s ashame they give you the not so nice rooms when booking with points. That’s disappointing especially if you decide to go back on a cash stay. I hate when properties do this you spent a lot of money earning those points, it’s not like you received them free. Those on points deserve the best room and service too!